It has been known that Sebastian Kurz saw the light of the day in Vienna on August 27. 1986. and that his Sun sign is Virgo. In an interview for the OE24tv he said that his Ascendant is Leo. I have made the birth time rectification for him and set the birth time to 3:44 AM, which gives the Ascendant of 7 degrees Leo and the MH of 19 degrees Aries. This birth time seems plausible, and I expect that it will be confirmed by future events. Leo Ascendant limits the time of the birth to the period between 3:08 AM and 5:48 AM. In the Placidus House-Tables for the Latitude of Vienna, it can be seen that for Leo Ascendant, the M.C. is in the range from 9 to 30 degrees Aries, as well as from 0 to 21 degrees Taurus. This means that the Solar Arc directions and transits of the planets in his chart, will make aspects to certain degrees within this range at the time of events. To range is extended to 30 degrees of fix signs, for Leo ascendant. Little is known about the private life of Kurz, so I will look at Solar Arcs and Transits for the three well-known and important stages of his meteoric career: April 2011 when he became the State Secretary for the Interior, December 2013 when he was appointed Foreign Minister (in April 2014 he took also the function of Integration Minister) and December 2017 when he was sworn in as Federal Chancellor. See the end of the text for a list of the Solar Arc Directions, their angular relationship to correlating degrees in the 8th Harmonic, as well transit positions. Click here for the listing. In the Solar Arc and transit picture for the last and most important station of his career, we see that 20 degree and 18 - 18 ° 50 degree are activated twice within the cardinal cross. 20 degree was activated by SA Jupiter and SA Pluto. 18 ° was activated by SA-Uranus and TR Pluto. 19 - 20 degrees in the fixed cross are also activated, by the Venus and the Sun. While the Sun may well stand for success, Venus is more associated with popularity, and when associated with the M.C. would not suggest a huge career jump, much less so when in connection with the ascendant. The house table shows that the M.C. at 20 ° Aries corresponds to the Ascendant at 7 ° 40 Leo. The M.C. at 19 ° Aries corresponds to the Ascendant at 7 ° Leo. By examining Solar Arcs and transits for these two potential Ascendant - M.C. Combinations, 18 ° 50 Aries for the M.C. and 7 ° 7 Leo for the ascendant prove to concur with the events. This requires a birth time of 3:44 AM. The first important position as State Secretary in the Federal Ministry of the Interior in April 2011 is indicated in this horoscope by the SA Mars, the ruler of the 10th House, who arced to the Ascendant in August 2011. The TR Jupiter reaches the M.C. exactly on the 17th of April. 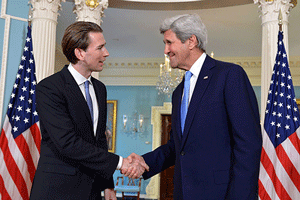 Kurz was entitled this office on 11th April and profiled himself as Secretary of State for Integration. The accompanying transits from TR Pluto to natal Neptune, from TR Saturn to Mars, from TR Neptune to the Gemini Moon in the 11th house and from TR Uranus to Neptune, suggest that he sought his place in a group (here political group), that despite some difficulties he was working hard on his goals, that he was networking a lot and that he was in a phase of refocusing. Note: Neptune rules the ninth house, Mars the tenth, and both are important for his professional profile as a politician. His first success, which attracted not only attention but also criticism from all sides, was in December 2013, when he was appointed to be the youngest foreign minister in Austrian history. This success is marked by the SA Ascendant to the Sun. The SA Ascendant reached in 2013 the constellation of natal Sun in the square to natal Saturn, which is the motor for his ambition, together with the Moon in opposition to Saturn. Soon after, in March 2014, affairs of integration came back into his area of responsibility. In 2014 we see the SA Ascendant in the aspect of the natal M.C., the SA Pluto in the aspect of the natal Sun/Moon midpoint, the SA Uranus arced to the Moon, the TR Pluto in aspect to Mars, the M.C. Rulers - everything points to an important career change. The most recent and largest career jump took place in December 2017. It is accompanied by the Solar Arc Direction of Uranus to M.C., as well as by the simultaneous transit from Pluto to M.C.. Both point to an important and dramatic move forward. Also in the period after 2014, Kurz took the opportunity to define his political profile - with "FPÖ topics, but with a focus on the future", as the later published internal documents confirm. We can track also that with this horoscope. Just at the time when the refugee crisis escalated in 2015, the TR Uranus crossed the M.C., and made its last hit just after the Western Balkan Conference, where the closure of the Balkan route was decided. The Uranus is the ruler of the 7th House, but does not only refer to the public. Uranus’ natal position in the 5th house relates to followers and everything that has to be done to win them, and pushes this topic prominently in the astrological picture. During this time, Sebastian Kurz also moved into international light, at the same time scoring points with his target group in his home country. The simultaneous transit of Saturn across the Moon in the 11th house indicates a deliberate strategy that would later bear fruits, but also suggests difficulties and resistance that accompanied him at that time. The Saturn return * in the same year corroborates the importance of the refugee crisis for the design of Sebastian Kurz’ career. That Sebastian Kurz has a stamina and that he has an instinct for strategy, is clearly shown his horoscope. In the autumn of 2016, the SA Jupiter reaches the M.C. and the SA M.C. reaches Neptune, the ruler of the 9th House, in the summer of 2016. This puts an emphasis on the activities that fall in the area of the 9th field: self-promotion and image cultivation, increased TV appearances, international presence. This is especially important because he acted from the position of Foreign Minister, which is also a domain of Jupiter. Last but not least, Jupiter crowns with success or with other opportunities the one that seeks to recognize favorable moments and not to miss them. The TR Jupiter activated the M.C. since the end of 2016 up to August 2017, and has presented Kurz further opportunities. The foreplay of the governing parties, which was to lead to the call for the new elections, also began around this time. Did Sebastian Kurz get lucky or is that Jupiter? The truth is, and we can see it in this example, that a situation can be exploited only to the extent that the preparatory work allows it, and only if one has the ability to recognize the opportunity as such.